For 2018, the Czech Countryside Museum at the Kačina Château has prepared a record number of exhibits. Here, you will be introduced to the life of bees or communication with animals and plants, we will present you with the greatest personalities of Czech agriculture, we will whet your appetite in an exhibition on historical confectioners’ shops, and you will be able take away recommendations on agricultural museums in countries of the former Austro-Hungarian Monarchy. 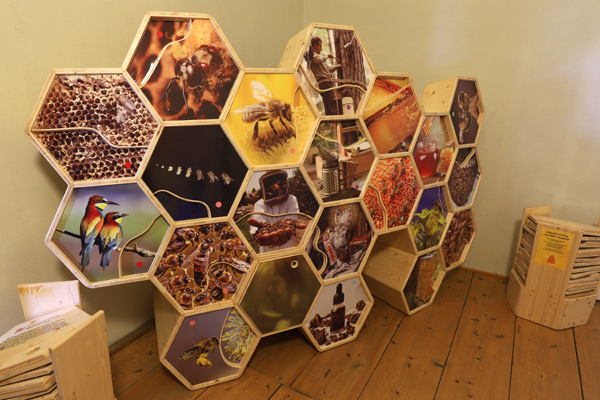 The most successful exhibition at Kačina last year was The Kingdom of Bees. Therefore, it has seen considerable expansion this year. While the first part is dedicated to the dwellings of bees including a live château hive, the new expansion allows access to the inside of a bee house, and offers an interactive game an other audio-visual elements. The exhibition also addresses the issue of the enemies of bees. This theme is loosely followed up with the exhibition Voices of Nature – How Plants and Animals Talk, which will introduce you to the fascinating world of nature and present less well-known methods of communication of fauna and flora. Here you will discover that animals “talk” through certain stable ways of behaving, which primarily use, besides vocal expressions, body language, or that even plants have developed social and defensive behaviour and even a memory. In 2018, the National Museum of Agriculture is celebrating the one-hundredth anniversary of its foundation. The Kačina Château is also commemorating the occasion, among other things, with the Faces of Agriculture exhibition, freely scattered around all of the premises for the entire season. An exhibition with a simple and interactive form presents iconic figures in the history of Czech agriculture. The year 1918 is commemorated by the panel exhibition Agricultural Museums of the Successor States to the Hapsburg Monarchy, which presents a flood of establishments of agricultural museums in the former Austro-Hungarian Monarchy and gives rise to the foundation of the Czechoslovak Museum of Agriculture in connection with events throughout Europe. The exhibition is being held under the auspices of the Minister of Agriculture, Jiří Milek. An attractive theme for tourists is a display of folk costumes at the Costumes of Czech Farmers exhibition. In an enlarged format, the exhibited reproductions present 36 colour etchings from the work Folk Costumes of Bohemian Farmers and Farmers’ Wives (Trachten böhmischer Bauern und Bäuerinnen), which were published in Vienna in 1814 by eminent graphic artists Antonín Pucherna (1776-1852) and Ludvík Arnošt, Count of Buquoy (1783-1834). The pictures originate from the period when the Kačina Château was being built and are supplemented with examples of folk costumes from the collection of J. A. Sobolíková.